One of the upturned flowerboxes beside the Cornmill in Coalisland. 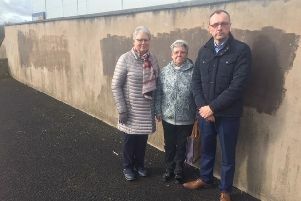 Flower boxes which were only recently refilled by Mid Ulster Council staff following a similar incident only weeks ago, were overturned in the early hours of yesterday morning. Local Sinn Fein councillor Joe O’Neill, who had been contacted about that incident, was then furious to learn that the same thing took place during the early hours of today, Sunday. Cllr O’Neill warned those responsible that their actions were not welcome. “Thugs have been out causing damage again last night at the Cornmill”, he explained. “They overturned one of the flowerbeds again. I know there hasn’t been a lot of damage this time but the flowerbeds have been refilled with a range of lovely flowers from the council and this is not wanted in our town.